UPDATED: Cal has been busy again, check out each team’s run home with five rounds to go. With round 18 dropping off…. here is the updated version of Cal’s Scale of Hardness with five rounds to go. West Coast are set to have a nice two weeks here before having a horrible run home over rounds 21, 22 and 23. Although a few of those games are at home, you have any Eagles players, I’d enjoy the next few before you see their name on the top of the list below. 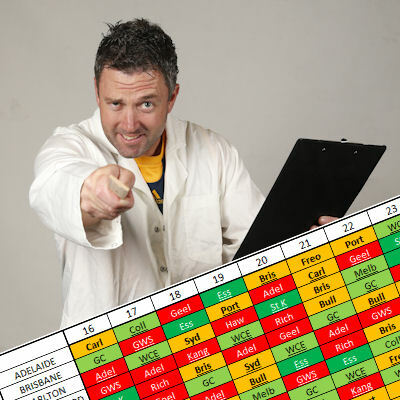 The Kangaroos, Richmond and Port look amazing for the next 5 weeks and should score more than normal. Targeting players here like Dusty Martin and even some of the Port boys who are on fire like Ebert (avg. 116 in his last 3) and even Ryder, Wines and Boak who are averaging 109 in their last three. Boak as a forward is a great option with the run they have. Port could win 4 of their last five here and really make a charge for a top 4 finish. I also like Brisbane’s run, after this week when they play the Eagles with 3 of their last 4 games at home. Hutchings will tag someone this week (Beams) and then they’ll play two games at home against the Dogs and Suns (no taggers) in games that could produce huge Fantasy scores. Watch out for players like Beams and potentially Rocky to go off in the last 4 games here. GWS are in a similar boat here with 2 home games in their next 4 (one not at SPO). They will destroy Freo this week after a shock loss on the weekend. Watch out for guys like Kelly who loves playing at home and even the likes of Heath Shaw to regain some much needed form. Why does that have to correlate with how many fantasy points they give up though? GWS shock loss? Really? I think Richmond on the MCG would have been favourites. Also, if I bring in Young I will play him over JKH in the FWD but it leaves me with no Emergency in the MID, whereas going Mount > Glass does. Do you think that this time of year it really matters that much as players tire more now than say in Rnd10. My point is that everyone is playing on a fitness more than anything. Might see more players rest etc… I also think teams like Port who are fighting for top 4, will not rest and try harder than others like Nth who are basically tanking. Thanks for your replie Calvin, appreciate all your hard work. Calvin, thanks for hard work, you legend! I do not understand this table. So each team is rated individually? How does this work?